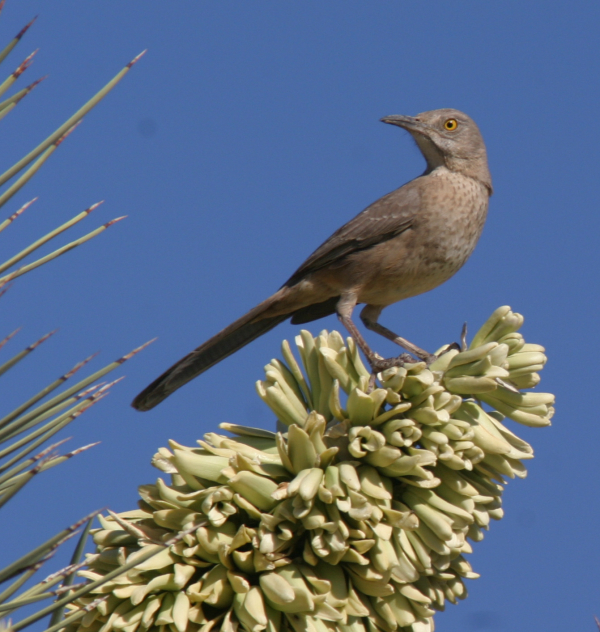 A Curve-billed Thrasher is a symbolic species of the interesting variety of Sonoran Desert birds. 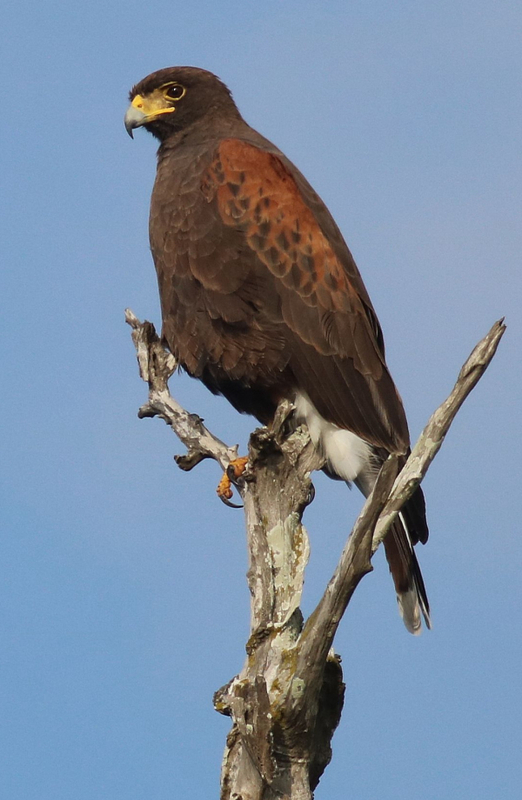 Harris’s Hawks can be seen hunting in groups, or perching on tall cacti. 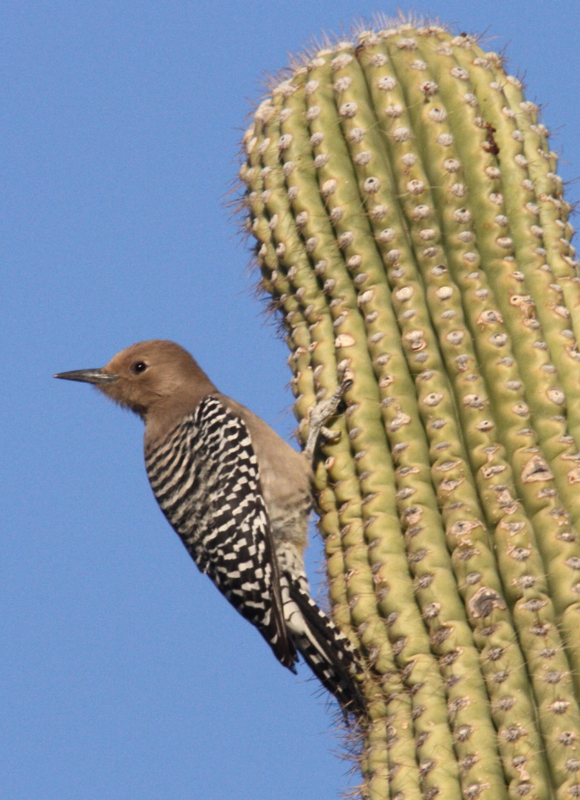 A Gila Woodpecker can be one of many life birds for first-time Arizona birders. Whether you’re a potential wintering or vacationing “snowbird” or a long-time resident, south-central Arizona is a great location for birders in search of new life birds, to study the avifauna of the Sonoran Desert, and to photograph resident and wintering species. While periodic winter rains green the Sonoran landscape, February through April is a great period for birding this unique cactus-dominated landscape, and to enjoy some beautiful weather. Certainly, the number of unique birds that range northward from Mexico, and the western species that flock here during winter are big attractions. 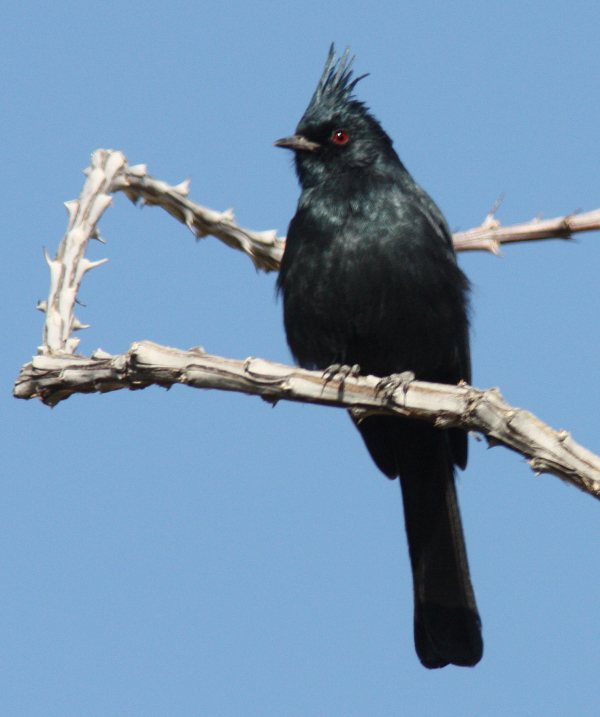 Plus you can enjoy such exciting resident Southwest species as Greater Roadrunners, Cactus Wrens, Curve-billed Thrashers, Gila Woodpeckers, Harris’s Hawks and the crazy-named ones: Phainopeplas, Pyrrhuloxias, Verdins and more. Centering on the most populous winter snow-bird destinations, my favorite locations have been east of Phoenix and west of Tucson – mostly native Sonoran Desert sites. Starting north and working our way southward, northeast of the Phoenix suburb of Scottsdale is a beautiful region protected as the McDowell Sonoran Preserve. Warm walks along a variety of hiking trails take you through an attractive abundance of native cacti and mountain outcrops that will yield an abundance of Southwest birds listed above, plus Gilded Flickers, Abert’s Towhees, Gambel’s Quail and, if you’re lucky, possibly a Vermillion Flycatcher or another rare species. Farther east of Phoenix, my favorite hiking and birding location is Peralta Canyon, located on the south side of the famous Superstitious Mountains. Drive east along Highway 60 past the town of Apache Junction to the Peralta Canyon turnoff. Along the way to the Peralta Trailhead, you will pass through beautiful landscapes filled with native cacti and palo verde trees where Harris’s Hawks are a potential treat along with three species of wrens – Cactus Wrens, Rock Wrens and Canyon Wrens – plus Gila Woodpeckers, Gilded Flickers, Verdins, Phainopeplas and more Southwest species. If you’re ambitious, hike up the picturesque trail to get a view of Weaver’s Needle – hidden natural monument – with good potential for birding surprises along the way (the hike is about five miles round-trip). To search for wintering birds, especially birds of prey, I like to drive east of downtown Scottsdale, continuing east of the 101 Freeway into the Salt River Indian Community where cotton fields and other agricultural land attract many wintering birds of prey. During a given outing, you may find a varied collection of raptors including wintering falcons – Prairie Falcons, Peregrines, Merlins and American Kestrels – maybe a Bald Eagle, plus Ferruginous Hawks and Red-tailed Hawks that usually include some dark-morph individuals. You should also see a number of Southwest species, along with the possibility of finding Burrowing Owls, towhees and wintering native sparrows. Farther south, west of Tucson, the west unit of the majestic Saguaro National Park is a favorite Arizona birding location. This area is more likely to provide views and maybe even photographs of the crested species: Northern Cardinals, Pyrrhuloxias and Phainopeplas, plus Black-throated Sparrows, Canyon Towhees, Loggerhead Shrikes, Anna’s Hummingbirds and Greater Roadrunners. In addition to the national park facilities and hiking opportunities in this region, there are many side roads and picnic areas in the area of Tucson Mountain Park that are fun to check for interesting birds among the dramatic mountain terrain. Tucson is the obvious location to travel east into the most famous birding region of the state – Southeast Arizona. Between Tucson and Madera Canyon there are remarkable birding locations, but that’s a whole different birding realm, and frankly, winter isn’t the best of seasons to visit the Southeast. We will describe birding opportunities there in a future article, in season; but any day birding in Southeast Arizona holds a level of excitement that you will find a rare bird wandering north from Mexico, which is only a few miles away after all; but the region holds plenty of remarkable birds to search for, along mountain slopes and river valleys – any day. The best takeaway message for this article is that Arizona has exciting birds found in a variety of birding locations throughout the state for vacationers, snowbirds and residents alike to enjoy – and warm sunny weather, even in February!